Recently, I had been to Manama Souq (behind Bab al Bahrain) with my wife. Manama still holds the traditional Bahrain. The dingy lanes of Manama, with shops on either side selling a variety of products, qualify as any other street of Mumbai or Delhi. If one enters the Krishna temple lane in the souq (market), it will appear to be a perfect Mumbai galli. Crowded shops, vegetable vendors, clothes spread across for sale, gold jewellery shops well lit, crowd surging to visit the temple, fragrance of marigold and jasmine flowers in the air, the unique scent of incense sticks, the aroma of spices coming from the traditional shops nearby! It’s a great feeling. There is hardly any space for people to walk by; over and above the cars passing by, at snail’s pace! To enjoy the culture and history of this lane, one should step out of the car and walk. No car can compete with anyone walking in this street for the person who walks can move faster than the car! Any visit to this lane will be incomplete without the darshan of Shri Krishna at the Manama Temple and a visit to the famous traditional Gujarathi restaurant at the end of this lane. After the Sri Krishna darshan drop in at the Gujarathi restaurant. Do not enter the restaurant with the concept of any hi fi restaurant in Bahrain. Keep all reservations and notion aside and walk in like you enter any small time restaurant in Mumbai or a road side dhabba near Delhi. The vegetarian Gujarathi restaurant is known for its food delicacies (I don’t get paid for promoting them!!!). It serves typical Gujarathi food and north Indian dishes. The middle class Indian population in Bahrain just love to be there. If you have still not visited, just try it once. Get in; you can consider yourself lucky if you and your family get a table immediately without waiting for 10 to 15 minutes. If you are a first timer in the restaurant, you will be lost in the chaos prevailing in the restaurant! But that’s the fun of it. Once you get a table; settle down and order a thali. That’s my personal favourite! There are two options; a full thali or a half thali, the choice is yours. You can order other dishes as well. Paneer bhurji is another great option; in case you would like to try. If you order a thali you get a plate with four varieties of mouthwatering vegetable dishes, curd, dal (Gujarathi style) and on Thursdays; the special Gujarathi kadi (a mixture made of gram flour and curd) too! On special days you will get sweets too. All other ingredients I cannot explain, my wife will have to do it. The thali served with hot phulkas/rotis smeared with ghee will just spur up the taste buds. Take a piece of the phulka, dip it in one of the vegetables and place it in your mouth. It will just melt in your mouth. Your mouth will just relish the taste and will not allow you to swallow it fast. The moment you swallow the first morsel, your hand will immediately go for the next. To add to your joy buttermilk, raw vegetables half cooked, sliced onions and a special chatni (very spicy) is kept separately in front of you. The entire focus at that time is on the food; nothing else matters! 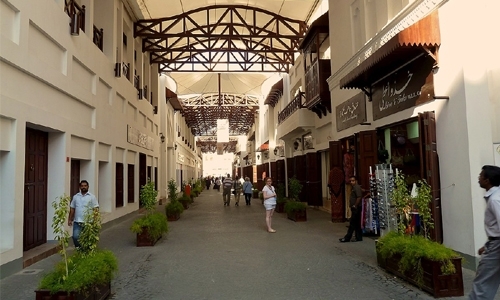 Manama Souq is one among the best destinations within the Kingdom. It has an irresistible charm, which keeps attracting large number of visitors, to the place which holds the traditional Bahrain.